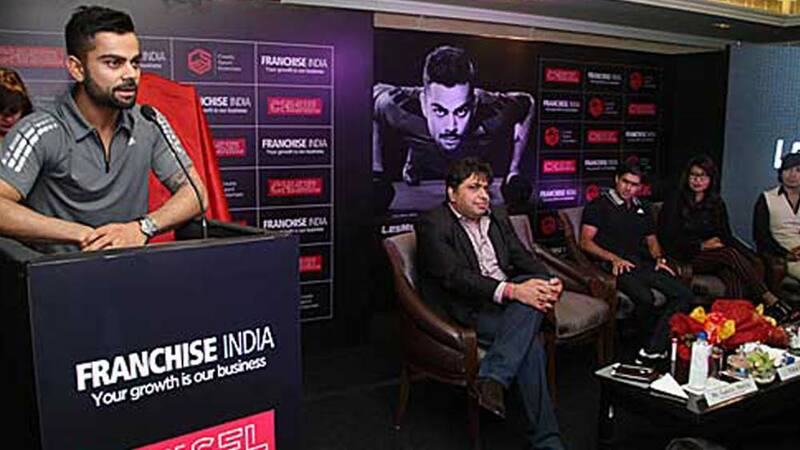 Asia’s leading franchising company, Franchise India, has partnered with Chisel Fitness, jointly owned by Cricket star Virat Kohli, Chisel Fitness LLP & CSE, the sister concern of Corner Sport & Entertainment. After unveiling the news of investing Rs90 crore in a new fitness venture, Cricketer Virat Kohli made a public announcement about joining hands with Franchise India, Asia’s leading franchise company, to exclusively market and expand his recently launched fitness chain – Chisel. Chisel is jointly owned by Kohli and his partner Satya Sinha, who is the Director of Bengaluru-based start-up Chisel Fitness LLP. Commenting on the recent tie-up, Gaurav Marya, Chairman, Franchise India said, “What entrepreneurs look at, obviously, is the brand name, which Virat (Kohli) is. He is the top most brand name I can think about today in fitness, and associates with almost all tiers of society, everybody, all age groups relate with him, knows him. The second is the system in process and knowledge about running that business which Satya (Sinha) brings in. She has a great experience in managing and running a business like that and as far as expansion is concerned, we, Franchise India would be doing that. So, it’s a great brand, backed by good system, good product, and good partnership. And as we announced that’s what an entrepreneur or a partner looks for. Chisel Fitness is expected to launch 75 centres across India in the next three years and aims to become the most preferred destination for holistic, innovative and new age health and fitness programmes. The brand, Chisel Fitness is founded by Satya and Shardul Sinha, who are first generation entrepreneurs in India. At present, Chisel is present in IT city Bengaluru with the first and only centre. However, the brand is targeting other metro cities like Delhi, Mumbai, Chennai and Hyderabad to open soon. The brand is also planning to showcase its fitness programmes via dedicated fitness events, with an aim to gain word-of-mouth promotion. Franchise India Holdings Limited (FIHL) is Asia’s largest integrated franchise solution company since 1999, and an absolute authority on franchising and licensing. FIHL has helped hundreds of investors in selecting the right franchise and, in turn, assisted numerous organisations in international and domestic franchise expansion. Forever Yoga, a new yoga apparel brand..